Garson, G. D. (2013). Longitudinal Analysis. 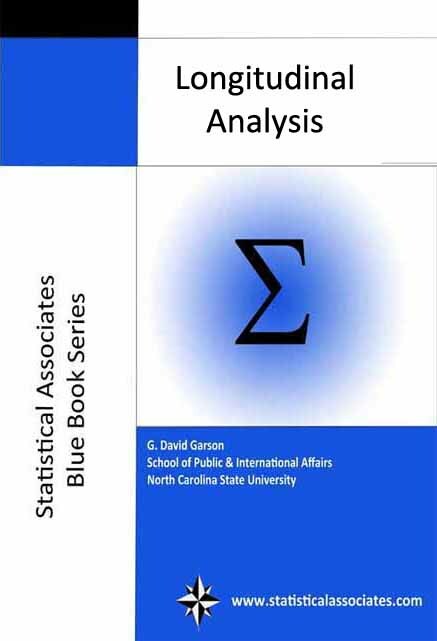 Asheboro, NC: Statistical Associates Publishers. An introductory graduate level text on longitudinal analysis using SPSS, SAS, and Stata. Time series analysis, often used for projecting economic or other time series, with or without additional independent variables. Linear regression models, which incorporate time as an independent variable. Repeated measures GLM, used to implement analysis of variance and regression models. General estimating equations analysis (GEE), used to implement nonlinear forms of regression modeling, including logistic and probit regression for repeated measures data. Linear mixed modeling (LMM), used for multilevel analysis where multiple time periods are treated as a data level. Structural equation modeling (SEM), used for growth curve analysis and modeling change in structural relationships across a limited number of time periods.